In May 2018, we welcomed Rev. 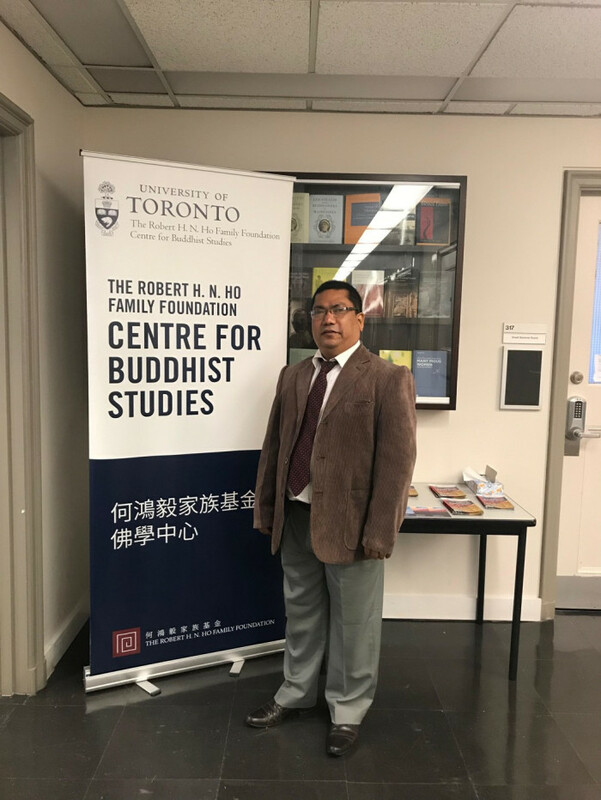 Professor Naresh Man Bajracharya, Vice-Chancellor of Lumbini Buddhist University, Nepal to the University of Toronto Department for the Study of Religion and the Greater Toronto Area to deliver five action-packed days of workshops and teachings centered around Newar Vajrayāna Buddhism. This series of events was an impressive united effort on part of The Robert H. N. Ho Family Foundation Centre for Buddhist Studies at the University of Toronto, The Institute of Traditional Medicine, three local community organizations; The Nepalese Canadian Heritage Centre, the Canadian Newah Guthi, and the Pashupatinath Mandir of Brampton along with key U of T faculty members, namely; Professor Christoph Emmrich, Professor Frances Garrett, and Professor Ajay Rao. 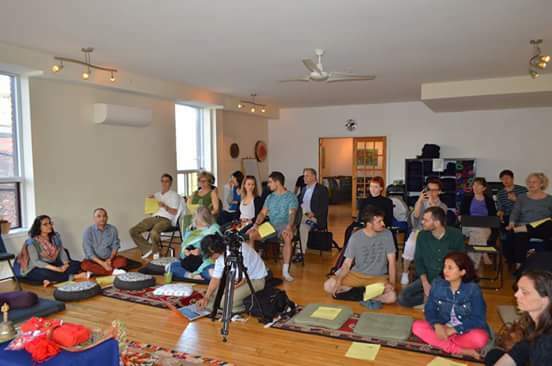 Present at his second visit to Toronto in just ten months were individuals from the Newar community, academics and Buddhist practitioners alike, engaged in the study of Sanskrit texts, Vajrayāna Buddhism and Newar culture, many of whom attended the full program from the 13th until 16th of the month. 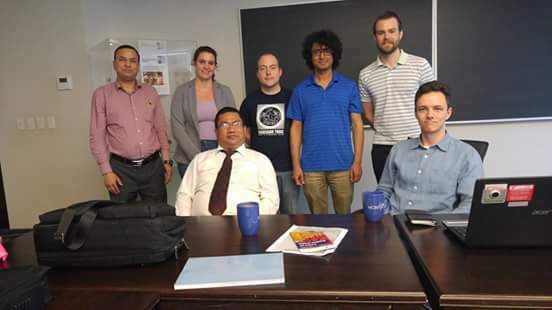 Professor Bajracharya with participants after his lecture on the Sanskrit Gurumaṇḍalārcanapūjā at the Jackman Humanities Building, University of Toronto. Photo courtesy of Mr. Rikesh Shrestha. Many of us know that Newar Buddhism has preserved both textual and living elements of Mahāyāna and Vajrayāna Buddhism in its Sanskrit forms. As one of the main students of the late Rev. Paṇḍit Badri Ratna Bajracarya, Dr. Naresh Guruju is recognized as a highly qualified ritual specialist who is responsible for Newar Buddhist communities in all three cities of the greater Kathmandu Valley area. As founding chair and distinguished first professor of the Buddhist Studies Program at Tribhuvan University, he has played a crucial role in introducing the academic study of Buddhism to Nepal. Over the past decade, Professor Bajracharya has established and recently consecrated the first traditional Newar Buddhist Monastery located outside of the Kathmandu Valley; The Nepal Vajrayāna Mahāvihār of Lumbini. He has also published widely on a variety of Buddhist topics in English, Nepali, and Newar. 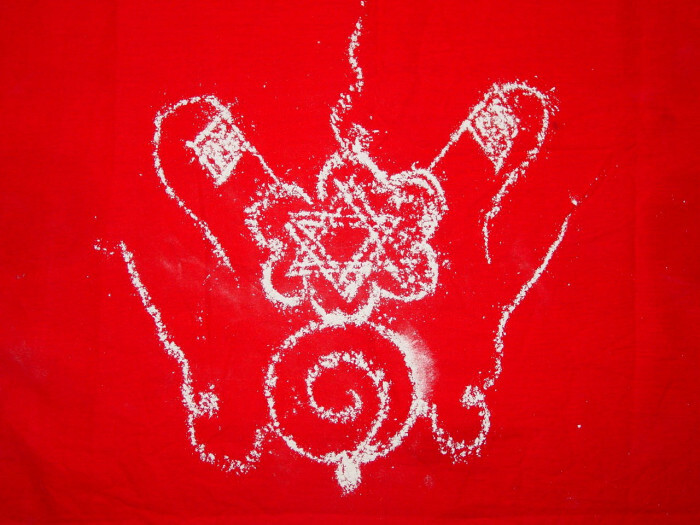 In short, a combination of conducive conditions came together which resulted in participants being fully immersed in a rigorous study of both ritual and academic aspects of this unique form of Sanskritic Buddhism seldom encountered in North America and which one is rarely permitted to participate in, in Nepal. Every minute of these events were recorded by Pushpa Acharya, a Ph.D. candidate and talented videographer who volunteered his time and energy for filming in collaboration with the Munk School of Global Affairs. Professor Bajracharya presiding over and commenting on the Tārā Maṇḍala Pūjā at the Pashupatinath Mandir of Brampton. Photo courtesy of Mr. Rikesh Shrestha. The first event, on May 13th, was a lively Green Tārā Maṇḍala Pūjā followed by a lecture and Q and A session. The day-long event included a delicious vegetarian meal organized jointly with participating members of local Newar and Nepalese communities. Before lunch, the maṇḍala of the female Buddha Tārā was materially and ritually constructed in approximately two and a half hours. With the help of around ten assistants from U of T and the local community, Dr. Bajracharya simultaneously directed the volunteers and acted on our behalf, leading us through the preliminaries, the invocation of Green Tārā, the making of offerings and the performance of all required rituals and recitations. In his afternoon lecture delivered in Nepali, Dr. Bajracharya explained the historiography and meaning of Green Tārā in the Vajrayāna Buddhist context; her origin from the tear of Avaloketiśvara and the significance of her green-hued manifestation related to elemental forms of prāṇa and enlightened activity. He also included some pertinent comments on the meaning of co-existence and interdependence in response to a question from the audience. 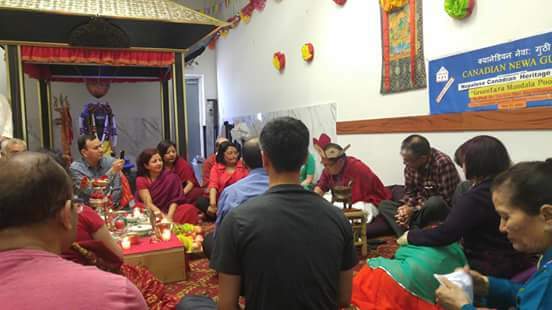 Although it was the first time that this Brampton area Nepalese Mandir had ever hosted a Vajrayāna Buddhist pūjā, the local Hindu priest who stayed for the duration, and many of the more than 50 participants agreed—true to the spirit of Nepalese religion—that it was indeed an ideal venue to hold a Buddhist pūjā. 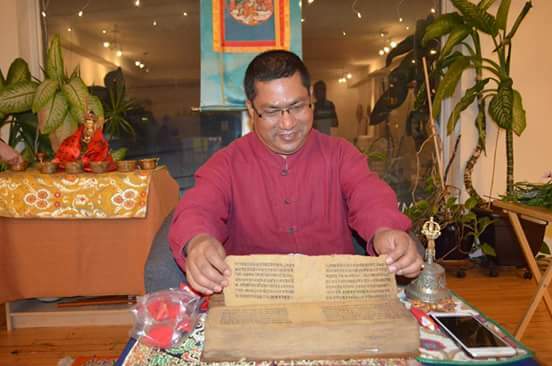 Professor Bajracharya displays his century old Sanskrit text after giving a lecture on dhāraṇīs. Photo courtesy of Mr. Rikesh Shrestha. On Monday evening at the Institute for Traditional Medicine, Dr. Bajracharya introduced us to the meaning and practical functions of the dhāraṇī: Sanskrit syllables or sounds strung together which he explained possess more than a mere semantic meaning. Somewhat longer than the further encapsulated mantra, we learned that the dhāraṇī can either contain the pith meaning of an important text or effectively embody the essence of a deity. Dr. Bajracharya discussed how dhāraṇīs have been traditionally engaged, and even imbibed, through all five modes of sensory perception. After a preliminary commentary on the saptavidhānuttarapūjā a.k.a the samantabhadracaryāpraṇidhānam, he instructed us on several popular dhāraṇīs to be utilized at the time of death, healing, and even for the the generation of empathy; the durgatipariṡodhana dhāraṇī, the aparimitāyu dhāraṇī and the āryāvalokiteśvara dhāraṇī to name a few. Participants and U of T students at the dhāraṇī event generously co-hosted by The Institute for Traditional Medicine. Photo courtesy of Mr. Rikesh Shrestha. On Tuesday, the first day of our formal Newar Buddhism Workshop at the St. George Campus, we all arrived ready to engage on a more intellectual level. Dr. Bajracharya gave a Power Point presentation along with many lucid descriptions and even utilized melodious traditional chants and gestures to explain the matter at hand, the Mañjuśrīnāmasangīti, in his trademark style. He conveyed how the Sanskrit Buddhist tradition of the Mañjuśrīnāmasangīti was historically conceived of; as providing complex textual correlates, and how it currently continues to persist as a living tradition in the Kathmandu Valley. More broadly, he discussed the trend of revitalization of this and other Newar Vajrayāna traditions as a whole and the role of the recent Nāmasangīti festivals and public initiations in that process. Not only did he explain the place of this crucial text in the history of Vajrayāna, we were also introduced to the future of this vibrant tradition which has currently evolved to incorporate significant concerns about inclusion and social activism as well as the preservation of oral transmission on a large-scale public platform. A certain highlight of this session was the gratitude shown to his wife, Rev. Nita Gurumaju, whom he mentioned had to work much harder than himself for the duration of the festival since she was called upon to initiate all of the female participants who happened to be the greater percentage of the more than 4000 festival attendees. A photo from Professor Bajracharyas’ presentation at U of T on the revival of the Nāmasangīti Festival in the Kathmandu Valley. 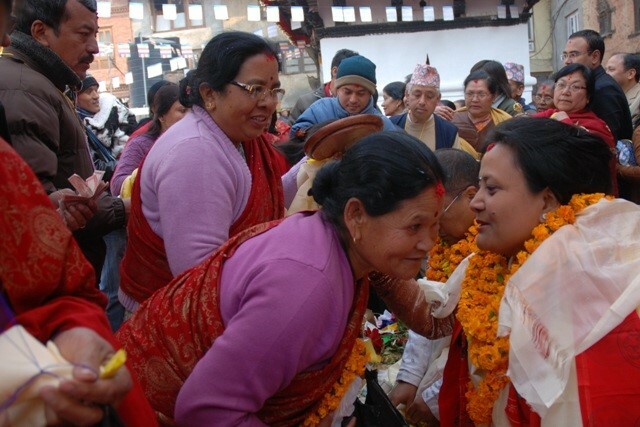 Professor Bajracharya’s wife, Mrs. Gurumaju Nita Bajracharya granted the Mañjuśrīnāmasanggīti initiation to more than 2000 female participants at that three day event. On Wednesday, the final day of the workshop, Dr. Bajracharya delivered an in-depth commentary and conferred some of his original research on the Sanskrit ritual text; the Gurumaṇḍalārcanapūjā, edited by the late Amoghabajra Bajracharya. Together with Professor Ajay Rao, who helped students with many difficult points throughout the Sanskrit reading, Dr. Bajracharya managed to cover the entire text and its artistic expression as maṇḍala art in scarcely three hours, making the meaning accessible even to those with basic knowledge of Sanskrit. As he took the audience through the text word by word, and the ritual, action by action, many questions were addressed regarding how the text can be dually performed and appreciated as a condensed philosophical treatise. Notable, was his explanation of the concise definitions given by the text for how to practice the Six Perfections; the perfection of giving, Dr. Bajracharya described, is likened to a person who can let go of the results of virtuous actions like a cow letting go of its own dung. Understandably, this passage also tied into his clarification of how to interpret obscure content that often requires the lineage of oral transmission in order to be comprehensible. Dr. Bajracharya then went on to explain how this text, in its material representation as maṇḍala art, seeks not only to express the gurumaṇḍala ritual, but it also incorporates the balyārcana offering which is depicted in several cryptic variations in a local, artistic sense; and carried out literally, as offering the five senses and sense faculties. Dr. Bajracharya noted it as an antecedent to the Tibetan gchod praxis. The dual purpose of text and artistic representation as both gurumaṇḍala and balyārcana was a crucial point that Dr. Bajracharya felt had not been appreciated by scholars in the past. An example provided by Professor Bajracharya of how Lalitpur gurumaṇḍala art (lower) also incorporates a depiction of the balyārcana offering (upper). Photo courtesy of Naresh Bajracharya. After completing the reading, Professor Bajracharya concluded a very animated lecture on a more serious note with some methodological advice to fellow academics in the beginning stages of their research. He encouraged researchers to constantly reflect upon and rethink their methodologies in order to acknowledge diverse cultural approaches to study and research, noting that we need to remain sensitive to such issues, especially while engaging with our interlocutors and local customs in the field. As someone with more than 40 years of experience at the top of his field and at home in Newar culture and language, Dr. Bajracharya stressed that the complex and multifaceted aspects of Newar traditions cannot be easily grasped in a few months or even a few years of fieldwork; namely by us! With this advice, we all became quite aware of the can of worms we had each opened, and many agreed, as Dr. Bajracharya had suggested, that patience and resolve might be the only sure keys to successful dissertations that do not result in hasty hypotheses in this, the unique and understudied field of Newar Buddhism. The events ended on a positive note with those present expressing their gratitude. We found Dr. Bajracharya to be a very accessible teacher from whom we all learned a great deal. Thanks went to the Department for the Study of Religion at the University of Toronto and especially The Robert H. N. Ho Family Foundation Centre for Buddhist Studies for supporting, advertising and organizing all events, and finally to Dr. Bajracharya, who took time out from his demanding schedule in Nepal to come all the way to Toronto, Canada after delivering a lecture at Harvard. Professor Bajracharya at the Robert H.N. Ho Family Foundation Centre for Buddhist Studies at the University of Toronto. Photo courtesy of Mr. Rikesh Shrestha. We wish to extend a sincere thanks to Pushpa Acharya, a Ph.D. student and film maker from University of Toronto who produced and edited all of the video footage. Reposted with permission from the Canadian Journal for Buddhist Studies Blog: https://cjbuddhist.wordpress.com/2018/06/09/tara-dhara%e1%b9%87i-the-manjusrinamasangiti-and-a-sanskrit-reading-with-rev-professor-naresh-man-bajracharya-of-lumbini-buddhist-university/.